Assume you used Views to build a page display (in Drupal 7). So you have the typical "master", and an additional display called (let's say) "MyPageDisplay". And assume that in this "MyPageDisplay" you "overwritten" various settings (fields, sorting, whatever) from your "master". And then you want to create a block display that's exactly the same (same filters, etc) as the "MyPageDisplay". There doesn't seem to be any facility to copy or clone such "MyPageDisplay"-display. How can you duplicate a Views display like "MyPageDisplay" as a different display type in D7? And is there any type of improvement in Drupal 8 about this? There is no out-of-the-Views-box solution for this in Drupal 7 ... Except if you get really creative (or via "ugly ways" as @MPD wrote in a comment below the question) with exporting / editing / reimporting such view. But that's not out-of-the-Views-box of course, and to my knowledge not included somewhere within the Views UI. Comment #1 in the issue about "Clone a Page view into a block view" seems to confirm this. In Drupal 8, for an existing display of a view, assuming it's a page display, you can say "duplicate this display as another display type". This will copy all of that view definition to the new display. This appears to be one of the most exciting new features of Views in Drupal 8 ... Apart from Views in Drupal Core (= VDC) ... of course. (1): In the Views settings, if you select “Allow embedded displays”, then they can be used in code via views_embed_view(). (2): In the Entity Reference field settings, select “Filter by an entity reference view” and use a view with this display type to define what can be referenced. Credits: "Babou", who made me discover it while listening to "Talking Drupal (episode 111)". Assume you used Views to build a page display (in Drupal 7). And you want to create a Block display that's exactly the same (same filters, etc). There doesn't seem to be any facility to copy or clone such display. Actually there is, you can clone it by clicking on +Add, then select Block. Although, if you want to clone the clone, you could export the view, and copy the export code from the other block and modify the machine name. Then you just import the code. If you then want to make changes to your block, so it's not an identical clone, you then need to select this page override when you click on fields, or other stuff, so it doesn't affect your page or any other view. How to display the same views exposed form block twice? How do I recover a deleted Views display? Is it possible to change the “view type” from a “content view” to a “search view”? 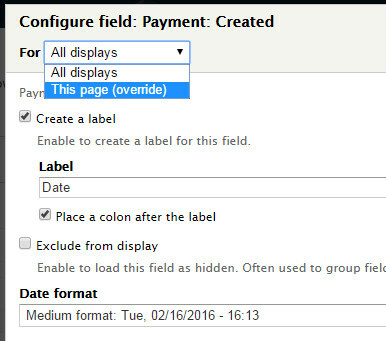 What is the purpose of Master Display in Views module of Drupal 7? Why is it not present in every Drupal 7 installation?